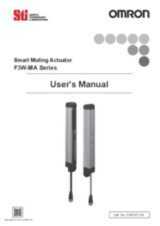 The F3W-MA smart muting actuator is an integrated sensor system utilizing multiplebeam sensor technology to configure muting systems in combination with the safety light curtain. Bracket to mount the F3SG-R.
Side mounting and backside mounting possible. Beam alignment after mounting possible. The angle adjustment range is ±15°. Bracket to mount the F3SG-R at the top and bottom position. The angle adjustment range is ±22.5°. Can be used in combination with the standard adjustable brackets. When using F39-LGMAL, there are some restrictions on the brackets to mount the F3SG-RA. This bracket is not usable together with F39-LGF. When using F39-LGMAT, there are some restrictions on the brackets to mount the F3SG-RA. This bracket is not usable together with F39-LGF. 1. Optional available F39-LGTB-1 Top/Bottom adjustable bracket set (4 pcs.) without angle bracket to mount to the wall. 2. When using together with F39-LGA, the F3SG-RA must be 270 mm or longer. 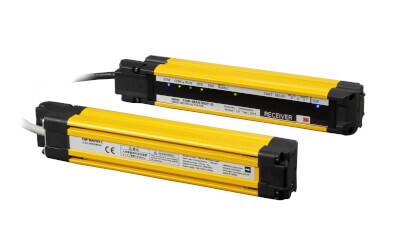 When using together with F39- LGTB, the F3SG-RA must be 400 mm or longer.